Considered one of the world’s most influential artists today, Ai Weiwei is a leading cultural figure of his generation and an artist of the times. His pieces question modern society, government and human rights with seemingly simplistic, yet politically powerful messages. His works are part of a collaboration between the Waller Creek Conservancy and The Contemporary Austin’s Museum Without Walls Program which extends the museum’s exhibitions into the community of Austin. 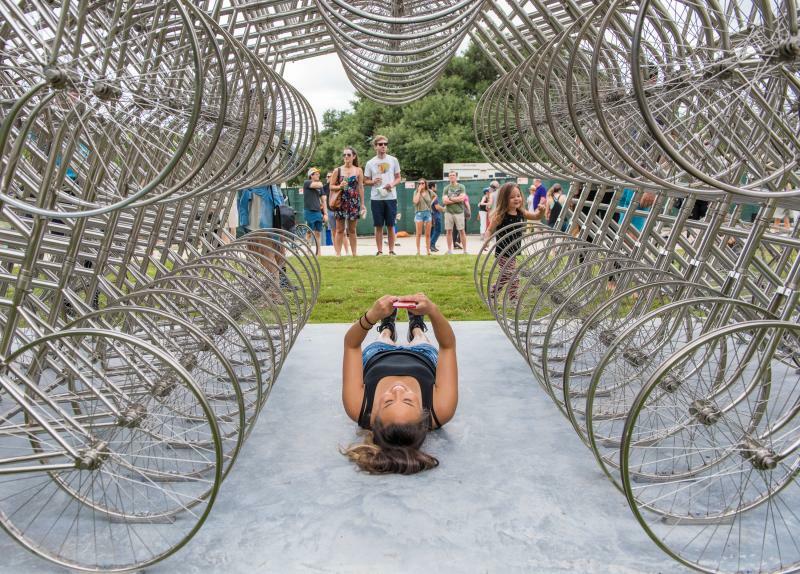 Ai Weiwei, Forever Bicycles, 2014. 1,254 bicycles. Dimensions variable. Installation view, Waller Creek Delta, The Contemporary Austin – Museum Without Walls Program, Austin, Texas, 2017. Artwork © Ai Weiwei Studio. Courtesy Ai Weiwei Studio and Lisson Gallery. Image courtesy The Contemporary Austin / Waller Creek Conservancy. Photograph by Brian Fitzsimmons. Located at the Waller Creek Delta (74 Trinity, adjacent to the Boathouse), this piece is one of the two large installations now open for long-term view. 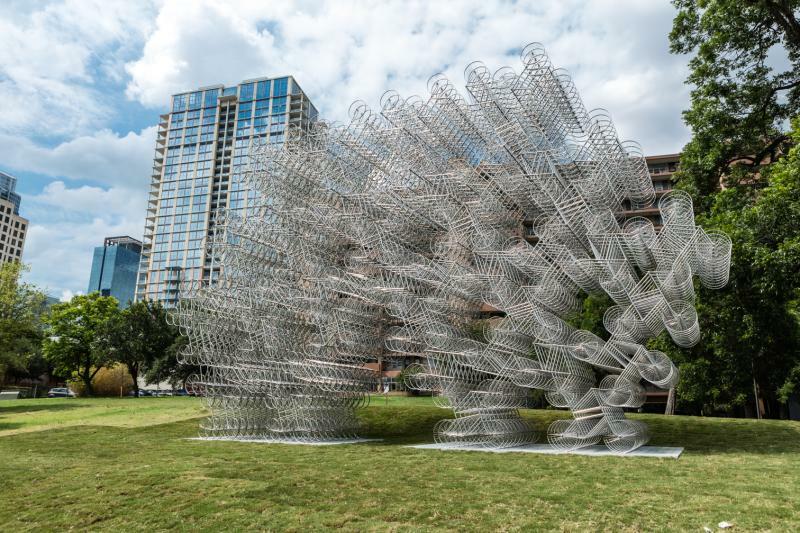 Weiwei constructed this sculpture using more than 1,200 stainless steel bicycles. He takes a stationary object and creates motion through the illusion of a dizzying maze of silver that changes as visitors walk around it. The title of this mesmerizing piece is a play on words. “Forever” alludes to the Forever brand - a Chinese company that produced bicycles that were financially out-of-reach for Weiwei during his childhood - as well as the illusion of an infinite arrangement of entangled bikes, and the suggestion that this form of transportation might not be everlasting, as the use of cars becomes predominant, even in China. Ai Weiwei, Iron Tree Trunk, 2015. Cast iron. 185 x 63 x 82 5/8 inches. Edition 1 of 3. Installation view, The Contemporary Austin – Betty and Edward Marcus Sculpture Park at Laguna Gloria, Austin, Texas, 2017. Artwork © Ai Weiwei Studio. Courtesy Ai Weiwei Studio and Lisson Gallery. Image courtesy The Contemporary Austin. Photograph by Brian Fitzsimmons. 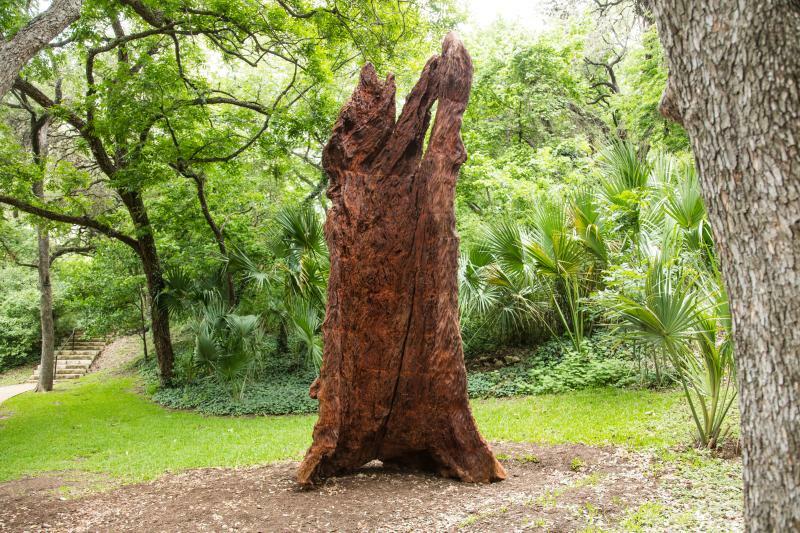 The second work, located at The Contemporary Austin’s Betty and Edward Marcus Sculpture Park at Laguna Gloria, is a 15-foot structure hiding among the real, natural landscape of the park. This hollowed out tree trunk was inspired by Chinese tradition to display dried out tree limbs and trunks for aesthetic appeal. Weiwei cast this piece from the remains of a once living tree. The elegant, yet unearthly figure in oxidized, rusted iron represents both industrialization and nature. Credit David Brendan Hall, Courtesy of Waller Creek Conservancy. The Contemporary Austin will also be partnering with the Austin Film Society in November 2017 on a film series organized by the artist. Take time experience Ai Weiwei’s special installations, on view today.